1.96% report having a DR solution, but only 50% are using cloud-based technology. Of that, sadly less than half utilize hybrid cloud technology, which offers the highest level of protection for your company’s data and IT infrastructure. 2. IT professionals, like everyone, have the of best intentions. 1 out of 3 have self-reported that they will revisit their disaster recovery solution within the year. Let’s hope they find the time to safeguard their organizations in 2017 as cyber-disaster is increasing at record speed. 3. Regarding a disaster recovery solution, reliability is ranked the number 1 priority for all IT professionals by over 50% of those surveyed. Cost is listed as the third priority, behind speed of recovery. You know what they say, you can have something good, you can have something fast, you can have something cheap, but you can can’t have all three. With the level of sophistication of cyber criminals increase, the same is required of your business’ disaster continuity planning. 4. 54% of companies report they have experienced downtime from a single event, lasting more than 8 hours. Eight hours of continuous downtime is full day of work. Here is a downtime calculator so that you can see what that translates to in dollars and cents. 5. 75% of all downtime is reported to be due to a power outage. Hardware and human errors round up the top three. In other words, even if you are not worried about safeguarding your business from a natural disaster, you still need to safeguard your business. 6. 1 in 3 organizations have reported being hit by a virus or a malware attack within the last 5 years. With malware on the rise, the numbers are only expected to rise, which is why cyber-education and protection are so important. 7. 2 in 5 companies still do not have a documented disaster recovery plan, and over a quarter admit to rarely to never testing them. Yikes. 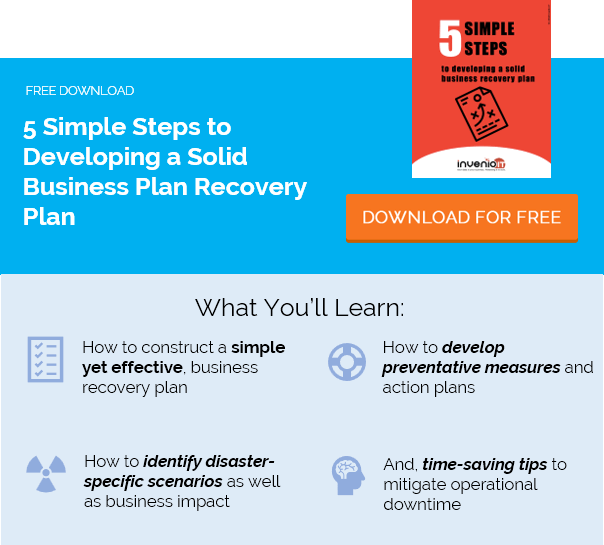 I know that if you’re reading this, you must have a disaster recovery plan in place, which is tested and adapted regularly! 8. Over one third of IT professionals are frustrated with business continuity solutions, citing they are too difficult to use. Business continuity has evolved so much over the last few years. Not all BCDR technology is confusing; we promise. 9. The majority of IT professionals know that hybrid-based cloud solutions make them more confident in data recovery versus on-premise only solutions. What’s more, IT professionals who utilize cloud-based technology as part of their Disaster Recovery solution, find it easy to deploy. 10. Companies with more than 500 employees are more apt to have a DR plan (74% of respondents in companies of this size), while only 54% of companies with less than 500 employees surveyed have a DR plan. That’s a lot of unprotected businesses. It is important to remember that cyber attacks as well as other forms of disaster do not discriminate. Businesses of all sizes need to have a disaster recovery plan if they cannot (or would prefer not to) incur the exorbitant cost of downtime. Now, those are ten 2016 disaster recovery statistics that will make you think about your current plan. *As part of this year’s State of Disaster Recovery initiative, 395 professionals in the IT field were surveyed to better understand their experience with IT disaster recovery, their plans and solutions, difficulties and response to downtime events. The survey was conducted online in October 2016 and included companies in over 20 industries, varying in size from less than 50 to more than 1,000 employees.